Of course, there will be those who are absolutely fed up to the back teeth with Angry Birds. Among them may be the early adopters who’ve since grown weary of the bird-slinging game, or those who were suspicious from the start, steadfastly refusing to become one of the many many millions of people who’ve downloaded the game onto their mobile devices and continue to enjoy spending countless hours battling with egg-stealing green pigs. Among those many millions are, for sure, a huge number of kids, drawn in by the cutesy graphics and simple game play. These same children – at least the ones living in the UK – will likely be impatiently tapping their parents on the back the moment they discover the country’s first ever Angry Birds theme park is about to open. Located in Nottinghamshire, England, the new activity park forms part of Sundown Adventureland, a popular day-out destination for families in the area. According to the designer of the new attraction, there’ll be themed swings and roundabouts, as well as several climbing towers. Of course, there’ll be a giant sling too, though hopefully someone will be on hand to stop over-excited kids catapulting their friends into the North Sea. There’s also talk of themed rides being introduced at some stage. 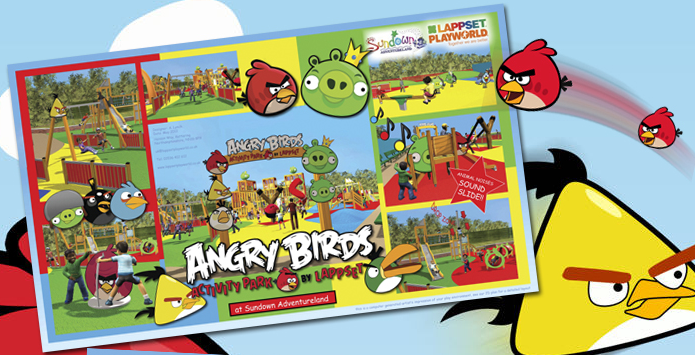 Of course, this isn’t the first Angry Birds-based theme park to open – there’s already one in China (albeit unauthorized), and another in Finland, where Rovio, the company behind the game, is located.